We have a playful, creative & alternative approach to life and we love to hold delicious spaces where you can delve deeper into a joyful exploration of your sexuality, sensuality & spirituality. Whether you have just begun your journey to discover your more sensual self or whether you are an experienced explorer of the sacred (and juicy!) mysteries we have something new and unique to offer you. 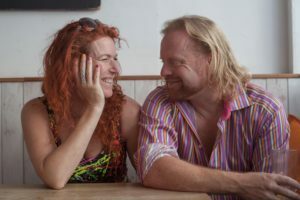 We are based in Brighton and we hold Love Lounges and Playshops at many festivals and events and offer Love Coaching and private bodywork sessions for individuals and couples in the UK and all around the world. We also hold a unique series of intimate Retreats for Couples at a private country farmhouse on various weekends throughout the year. We have been loving, working and playing together for the last 23 years. Our journey with Tantra and Sacred Sexuality supports us to explore the joys of relationship and sexuality in many different ways and this continues to deepen our connection and openness with ourselves, each other, and those around us. With our unique combination of integrity, authenticity, honest communication and laughter, we invite you to come and share a deep and delicious experience in a safe and nurturing space. Together we will create a space where we can get out of our heads and into our hearts: think less and feel more. In all our playshops and private sessions, we are here to ensure you feel really safe and supported in your choices and explorations of yourself, whether individually or in connection with others. We offer you a space to re-connect with your own true expression of sexuality and joy, so……. come and explore with us! Sy and Ash: BE MORE!